Art Statement for exhibition at Artspace. How true is that of many of our thought patterns when we face life’s consistent hurdles and curved balls. I seek to be thankful for moments of peace and hope. The content of this series of work is taken from my hometown Durban. 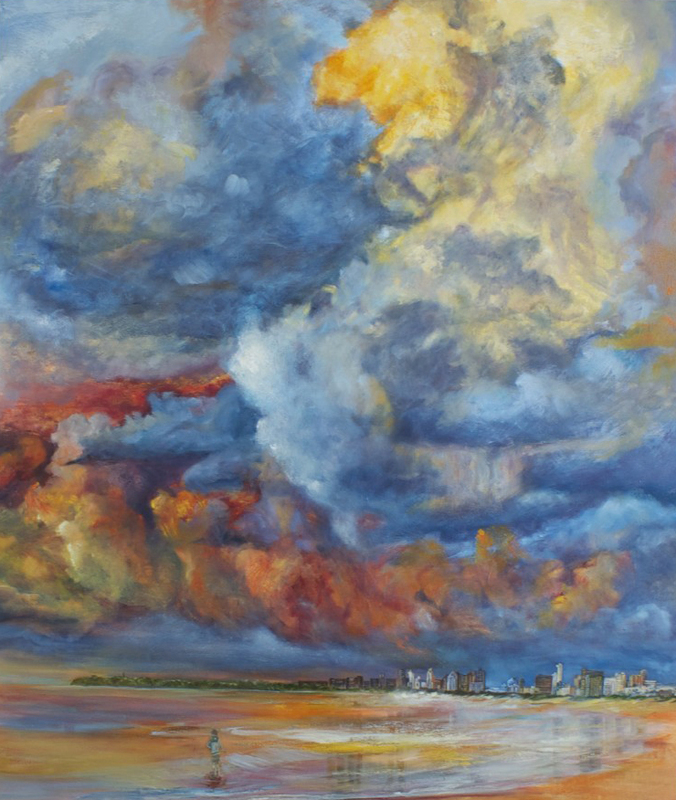 “ Natal “ depicts a symphony of cloud formations resting over the horizon of Durban. As I dance with paint, the colours radiate, forms move, short and long brush marks fuse to bring about a monumental and dramatic effect. Life is not all painful, but filled with moments of escape, of beauty and of hope. My pursuit is to freeze these islands of stillness and of movement. To document by means of a visual journal the people and places that my eyes’ lens focuses on. My soul is inspired , enriched and encouraged, like the sun’s rays upon one’s back in the middle of a wintery season. Dramatic configurations of clouds, water, land and the figure depicts the world we know, but suggests the possibility of something wonderfully greater. By inviting the viewer to share this space, I hope to convey new ways of seeing and of being encouraged in a world which holds the promise and fulfilment of an inexhaustible life.